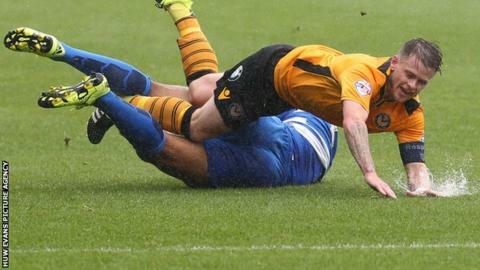 Newport claimed an encouraging draw in a pre-season friendly against Queens Park Rangers on Sunday. The visitors, who were relegated from the Premier League last season, fielded a strong team at Rodney Parade. Midfielders Alejandro Faurlin and Junior Hoilett, ex-Swansea and Cardiff defender Steven Caulker and ex-England goalkeeper Robert Green all featured. New County signings Lenell John-Lewis and Scott Boden both went close for the home side. Following an even first half in heavy rain, the weather brightened up after the interval and the 1,500 or so Newport fans in a crowd of 1,840 saw Terry Butcher's side come close to breaking the deadlock 10 minutes into the second half. One of the few County players still with the club after last season, midfielder Yan Klukowski, volleyed over the bar after a slick five-man move. QPR substitute Matt Phillips then shot just over after 71 minutes, but that was the last time either side came close to scoring. Newport play their final warm-up game at Weston-super-Mare on Tuesday night, before they start their League Two campaign away at Cambridge United on 8 August.